Everyone knows how important nutrition and hydration are to any physical activity, and never is this more evident in a sport as physically taxing as cycling. For the first time ever in this country, we combine endurance and recreational cycling with a 100% plant-based diet for a full five days. 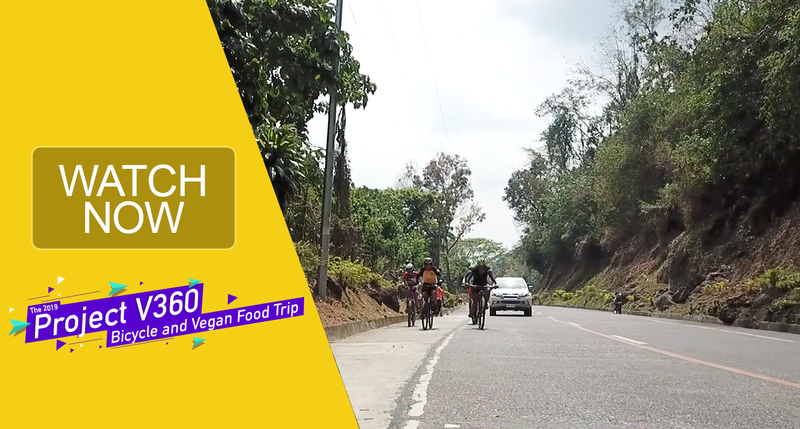 And we’ve made sure that our cyclists and support crew will never go hungry nor wanting for meat, because we’ve got with us one of the country’s best vegan chefs, Edil Villamor and his hardworking kitchen crew Rolly Duran, Jeffrey Tabug, and Norman Torres. How does his team do all of this? Keep watching! The reason for being of the 2019 Project V360 is precisely this: You can make your own body healthier through a combination of exercise and the proper, humane, and compassionate diet, while at the same time, you can also make your environment a place fit for all living beings to thrive in. You just have to remember: “V360”. Be an all-around vegan, and you’re on your way to making our world an even better place, one step, one pedal, one kilometer, one plate, at a time.